In recent years the controversy in Southeast Asia around elephant tourism and what an ethical elephant sanctuary is has increased tenfold. In Cambodia, in particular, in the Mondulkiri province, more and more conservation or ecotourism projects are opening. They claim their goal is to protect these gentle giants and of course, some do. However, there are also some that don’t, instead, they exploit the elephants and the local indigenous communities. Since we left the UK for Cambodia I’ve had wildlife and nature conservation volunteering on my to-do list. So last month Andy and I decided to go to Mondulkiri in Northeast Cambodia for a break from Siem Reap. We planned our trip around a visit to the Elephant Valley Project (EVP), where we’d spend some time volunteering and observing elephants in their natural surroundings. I believe that first and foremost an elephant sanctuary is somewhere that previously captive, worked, and mistreated elephants can retire. Somewhere they can live out the rest of their days in safety, without working or cruelty from humans. It should enable them to live in an environment as close to their natural habitat as possible. They should be able to roam free like a ‘real’ elephant. Secondly, an elephant sanctuary should protect, support, and work with the indigenous tribes (the Bunong in Mondulkiri), as their land and culture is essential to the maintenance and growth of the conservation effort. 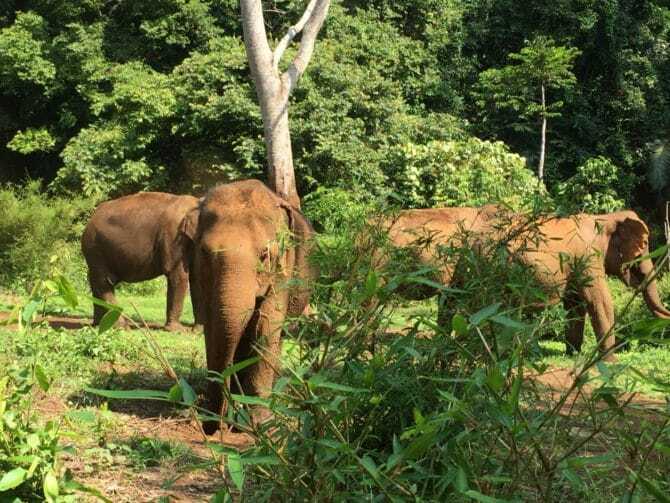 There are two types of elephant projects in Mondulkiri, Non-government Organisations (NGOs) run Elephant Sanctuaries, and Bunong run Community Projects. The comparison of which isn’t the purpose of this post, I’m not going to launch into a debate about which sanctuaries are best and why. Ultimately ethics is based on your own personal beliefs and morals. After extensive research we felt the most ethical project was the Elephant Valley Project so we decided to visit there and review our experience. 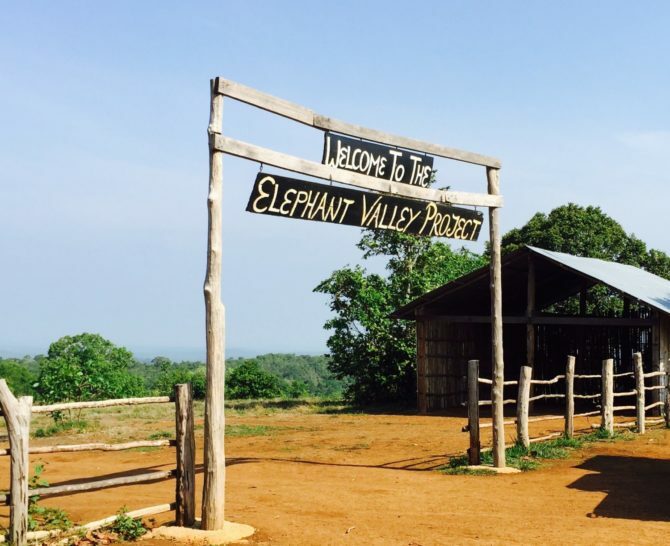 The EVP is the largest elephant sanctuary in Asia and is about 15 minutes drive away from the small town of Sen Monorom in Mondulkiri. It has over 1,500 hectares of grassland, forests, and bamboo. The ideal habitat and space for the 10 elephants that currently live there. It is run by the registered NGO, Elephant Livelihood Initiative Environment (E.L.I.E.). 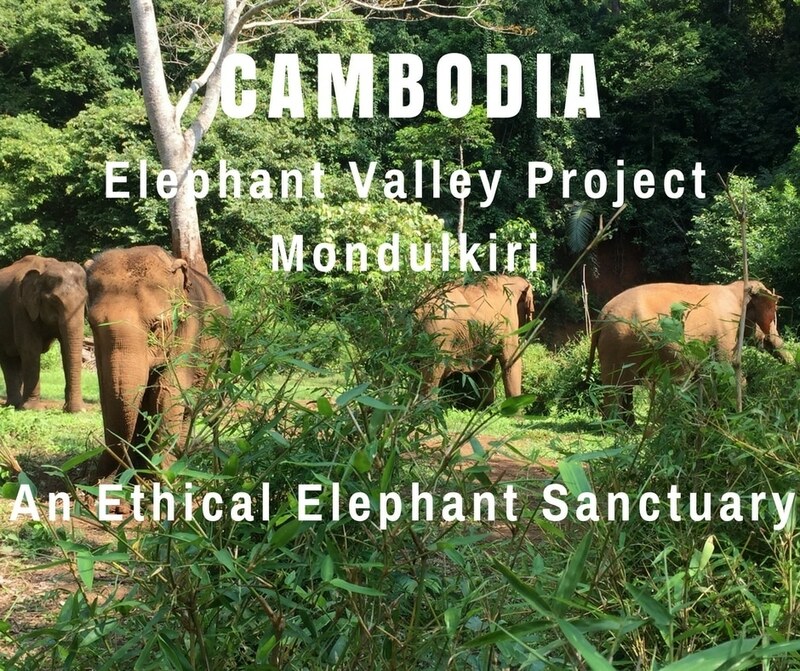 The EVP proudly claims to be the only ‘true’ elephant sanctuary in Cambodia. I interpret this to mean the only ‘truly ethical’ elephant sanctuary. They do not allow riding, washing or feeding of the elephants, in fact, the closest you’re allowed is about 100 metres from them. The use of bullhooks is also forbidden, as are restraints and any form of cruel treatment. The EVP donate 50% of profits to charity and are also involved in the conservation and protection of the neighbouring Seima Wildlife Sanctuary, home to a good number of wild elephants. I was semi-hosted for my volunteer and elephant experience at the EVP and have reviewed our stay below. Read more in our full Product Review Disclosure. Our trip to the EVP started early as we arrived, yawning, at the Hefalump Cafe in Sen Monorom at 6:45 am. There we met some others who would be joining us, along with Connaugh, the EVP’s ‘Forest and Elephant Interpreter’. We shared our passport details, then after a quick cuppa and a delicious slice of carrot cake for breakfast, it was time to leave. Before leaving we were asked to leave any bananas in the truck when we arrived. Elephants can smell bananas a mile off and it makes them behave out of character. Too many bananas are also not good for them, despite popular belief. At around 7:15 am we piled into a pick-up truck, ready for the short drive out of town, down red dusty tracks to the EVP base camp. As soon as we’d arrived at the EVP and fallen out of the back of the pick-up, Connaugh gathered us to share some background on E.L.I.E and the EVP. He explained how it all started, had grown and was now maintained. He also explained the difference between rescue elephants and contract elephants. Rescue elephants are purchased from the owners outright for between $15,000 USD (£11,600 GBP) and $20,000 USD (£15,470 GBP). Contract elephants are rented in exchange for rice, plus employment for mahouts from that family or community. The mahouts take it in turns to stay at the EVP, each for a few months at a time to look after their elephants. We were also introduced to Touern, ‘Head Forest and Elephant Guide’, how along with Connaugh was responsible for guiding and keeping us safe over the next two days. They would also tell us all about the EVP, it’s elephants, the forest, and the local Bunong communities. Over the course of our two-day stay at the EVP we spent three half days trekking through the forest to observe the elephants (who are between 25 to 66 years old) from a distance. Our first elephant encounter was with ‘The Heaven Girls‘. They’ve been named that because the forest they live in is perfect elephant habitat…it’s like heaven for them. 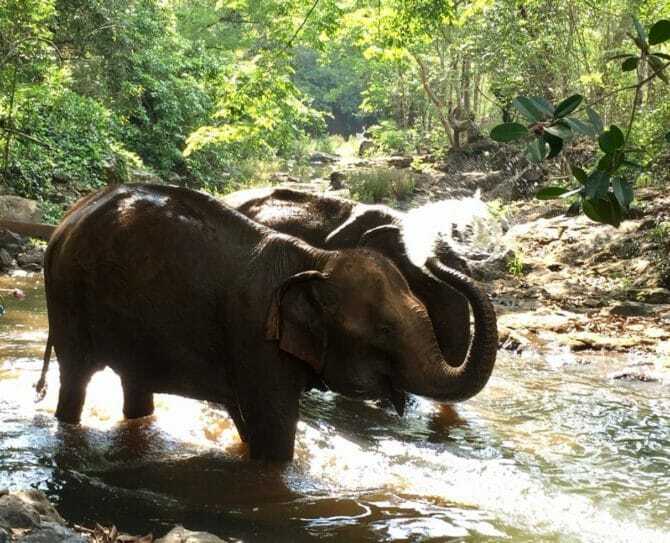 We watched Ruby, Mae Nang, Pearl, and Ning Wan bathe in the stream with the help of their individual mahouts. Ruby was the last one in the water and the first one out. In her former life she’d had a bad experience whilst logging and had nearly drowned. It had a lasting impact on her and to this day she’s still very nervous around water. As soon as the girls were clean they promptly covered themselves with mud again, then went to give themselves a good scratch against some trees. We spent the next hour or so following them through the forest and watching them enjoy exploring and eating as they went. After a good lunch and some free time to rest, we took a short pick-up drive, then headed back into the forest to meet more elephants. This time we trekked to a different river location. We perched on rocks in the river and waited for ‘The Terrible Two‘ – Easy Rider and Gee Nowl, to put in an appearance. There was no hesitation from these two to get into the water. They thoroughly enjoyed their bathtime before lumbering back off out into the forest. Easy Rider and Gee Nowl earnt the nickname ‘The Terrible Two’ from their antics. Given half a chance they’ll run off and destroy nearby banana plantations. Easy Rider is the brains of the outfit whilst Gee Nowl is her faithful partner in crime. During the trek that afternoon Touern told us about the local Bunong communities, and their beliefs and traditions. It was fascinating. The Bunong are Animists, they believe everything has a spirit – plants, animals, waterfalls, stones, hills etc. They also believe elephants have an important connection to these spirits, which makes them a sacred animal. That first day we also had two chance encounters with Sambo, Cambodia’s celebrity elephant. She’s well known for the many years she spent giving tourists rides at Wat Phnom in Phnom Penh. Walking on the scorching tarmac day in and day out took its toll on her feet and the treads burnt away leading to severe infections. She’s currently undergoing treatment at the EVP and is now beginning to recover and enjoy life again. Another highlight was spending a night in the forest. There was plenty of time to relax and socialise before and after the communal evening meal. The lounge was a comfortable, spacious area, with an open front that overlooked the forest. Sitting listening to the sounds of the forest, watching the butterflies before dusk, and trying to spot fireflies in the dark was a great end to a busy day. By 8 pm everyone was shattered and headed off in different directions to bed. It’s worth remembering where you are and expect there to be lots of frogs, geckos, spiders, mosquitoes, and other bugs – don’t forget your insect repellant. A head torch is another essential as it’s a bit of a walk through the forest to find the toilet and shower blocks. I found my torch also came in handy to check the toilets for wildlife; I had an audience during my midnight toilet trip. A huge spider and a big tokae gecko were chilling on the rafters and a frog stared up at me from the toilet bowl. All part of the experience though! Andy and I fell asleep to the sound of cicadas and geckos and had the best nights sleep we’d had in ages. Besides our three half days of elephant time, we also spent half a day volunteering in the tree nursery. After breakfast on the second day we received a quick briefing from Tarah the ‘Volunteer Coordinator’; then headed down seemingly endless steps to the nursery. 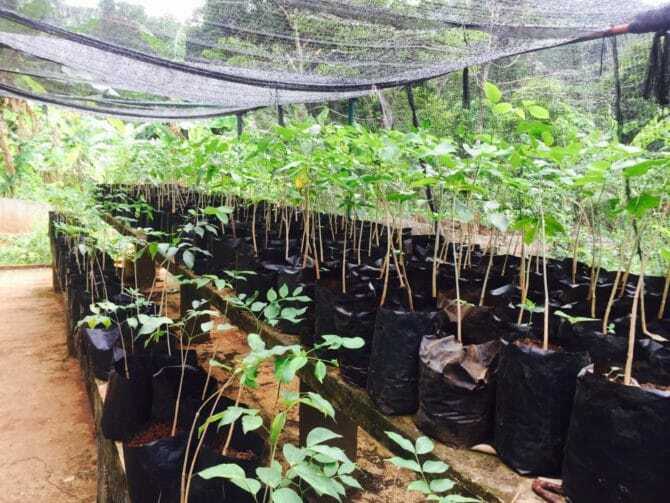 The main aim of the nursery was to cultivate trees to replace those removed from the forest by illegal logging and deforestation. Help was needed with many tasks so we split up and got to work. Between the group, we watered around 200 Beng saplings, sawed up a fallen tree to use for repairs, chopped down banana trees for elephant food, and varnished lengths of bamboo to make into a table. Finally, we all pitched in to pull up the invasive Siam weeds that were threatening to take over everywhere. Andy also got the chance to look at a blocked borehole, to see if he knew how to fix it and make suggestions on how to irrigate the nursery. He was in his element as this is where his background lies and he loves a challenge. We had regular water breaks as we worked, during which Tarah told us more about the work and volunteering at the sanctuary. As we worked every so often we could hear the buzz of a chainsaw in the distance. Tarah explained more about the illegal logging and how dangerous it is for the men and boys that do it. It’s often the case that they feel they have no choice, and it’s the only way they can make money to feed their families. We only did one morning of volunteering but some volunteers stay for two weeks or more. The last elephant we met before leaving the EVP was the only male/ bull elephant – Hen. He kept us waiting before he made an appearance, before crashing through the trees from the opposite direction to what we were expecting. 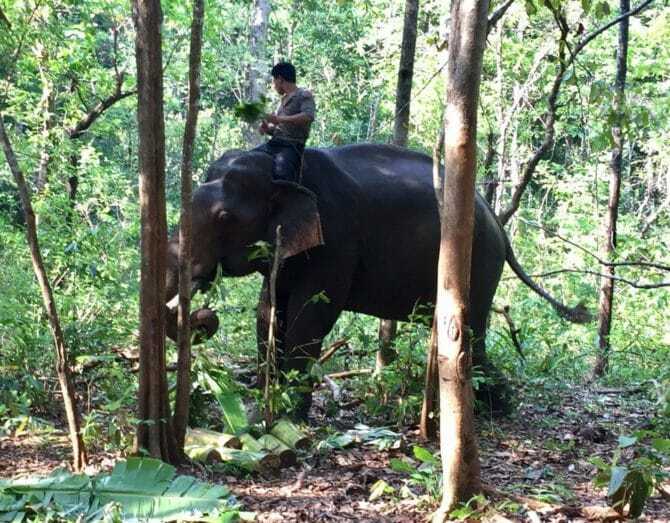 Hen’s mahout was seated on his neck and had to duck to avoid being knocked off by branches. It was great to watch Hen bathe, he was the only one of the elephants that really knew how to do it by himself. You could see him using the rocks beneath the surface to scrub the mud off. After his bath, it was time for some food. Hen has to walk a long way through the jungle to reach the river and so needs a huge amount of food for energy to get back. We spent the next hour or so watching him munch his way through the huge pile of banana trees we’d chopped down at the nursery that morning. As soon as he’d finished he turned his back on us and ambled back the way he came. During our time at the EVP, Connaugh and Touern took it in turns to tell us each elephant’s story. They all had one thing in common, before arriving at the sanctuary they’d all had a hard life. Many came from the logging industry or from carrying tourists on a daily basis. Some had experienced awful living conditions, including being chained in confined spaces, with a poor diet. Several were even missing body parts. Pieces of elephant ear are sometimes used in traditional medicine, and the tail ends used to make elephant hair bracelets. Most of them also had scars or damaged eyes from the use of sharpened bullhooks in their previous lives. The stories were sad to hear, but at least at the EVP they are now getting the chance to enjoy a better life as a wild elephant should. They get to eat, bath, sleep, roam through the forest, and socialise with other elephants. Throughout our experience the passion, dedication, and knowledge of the staff members were obvious. The level of elephant and forest knowledge imparted to us by the coordinators and guides (both Western and Bunong) was incredible. The Bunong mahouts also deserve a special mention, without them the management of the elephants would be impossible. The ladies in the kitchen also did a great job of preparing tasty meals to give us the energy needed for the forest treks and volunteering. Then, of course, there are all the other staff, many from the Bunong communities, who keep things running in and around base camp and out in the forest. Included in the price of our stay was all meals which were served buffet style. There was always enough to have a very healthy serving and sometimes seconds. Lunch and evening meals had a vegetarian and meat or fish dish, plus rice, pasta or both. Then a fruit selection for desert. There was also free filtered water, tea, and coffee available. Breakfast consisted of pancakes, omelettes, baguettes, fruit, tea and coffee; more than enough to see us through to lunchtime. Other soft drinks, beers and snacks were also on offer for an extra cost. Given the forest location, we were pleasantly surprised with the accommodation. 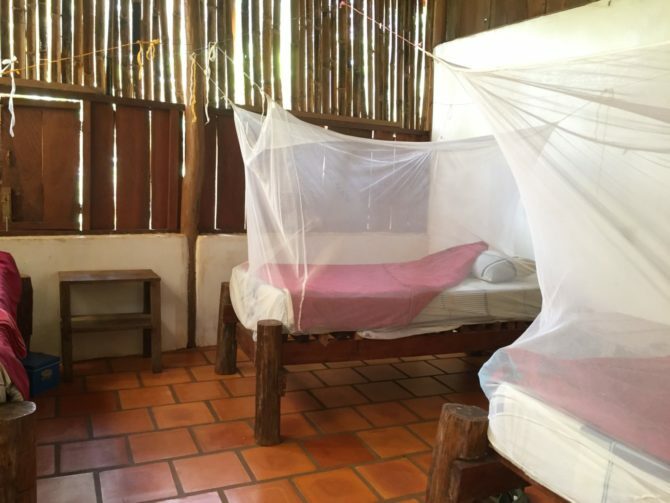 Yes, they are fairly basic wooden huts, but they were clean, tidy and have mosquito nets on every bed. The bedding was also clean. There was a choice between volunteer dorms for three or four people or private bungalows. We went for a dorm and it was absolutely fine. The only thing to be aware of is the accommodations are not completely closed to the forest. You need to expect to have a multitude of bugs flying around you in your room. So long as you’ve tucked the net in properly you shouldn’t have any problems. Insect spray is also provided in each room so you can use that if they’re really annoying you. You might even have the odd resident gecko or two but these are harmless. 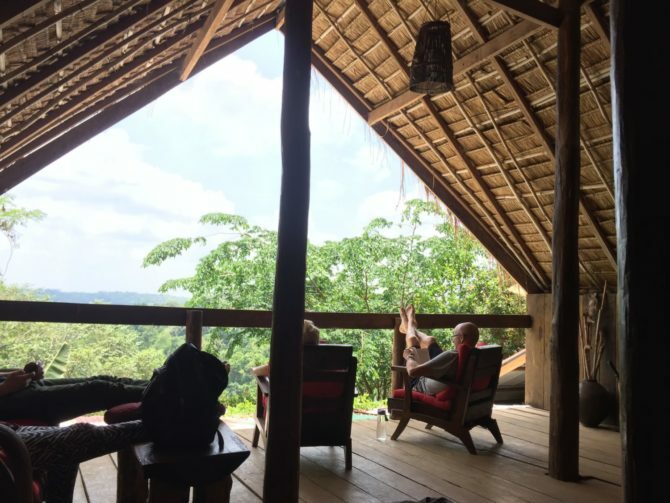 The price of a visit or stay at the EVP ranges from $55 USD (£42.50 GBP) for a half day visit up to $455 USD (£352 GBP) for a five-day, five-night volunteering stint, in a private bungalow. It’s actually quite straightforward (if a little lengthy) to get to Sen Monorom. We book all our bus tickets in Cambodia online via Cambo Ticket. We started in Siem Reap and caught the 11 pm Giant Ibis night bus to Phnom Penh. It took about six hours, cost $16 USD (£12.40 GBP) and arrived at about 5:30 am. We then got a tuk tuk to the TVT Mondulkiri Express bus office and took an express van from there to Sen Monorom. This took another five or six hours and cost $11 USD (£8.50 GBP). Visiting and volunteering at EVP was one of the best things I’ve done since arriving in Cambodia, it was educational and rewarding. Being able to spend time observing these gentle giants, that had been enabled to act like wild elephants in their natural habitat, was amazing. You can watch some of this on Andy’s vlog about the EVP. We felt reassured that the project endeavours to work with and support the local Bunong communities, however, I’m also aware of the fierce debate around which type of elephant project is best. To be able to form a more balanced opinion I hope to return later in the year to Mondulkiri and visit one of the community-based projects. 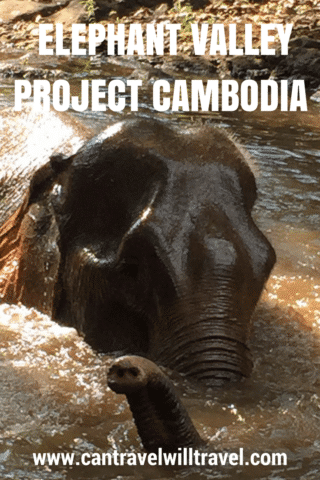 Have you visited or volunteered at the Elephant Valley Project in Mondulkiri, in Cambodia or another ethical elephant project in Southeast Asia? I’d love to hear about your experience and feelings on the subject. Product Review Disclosure: The Elephant Valley Project provided me with a discounted two-day, one-night volunteering and elephant experience. This did not influence my post in any way and as always I’ve provided a balanced and honest review. Yes me too, my husband posted a video on his YouTube channel of the Heaven girls but he’d run out of battery by the time it got to Hen! This sounds amazing! This is definitely something I’d love to do. Such beautiful creatures. It was, just wish we could have volunteered longer! Highly recommend it ? There is another elephant sanctuary in Sen Monorom worth visiting. It is managed by a Cambodian and all the staff are Cambodia. It has rescued 4 elephants in the past 3 years. It also rents a large area of forest to protect it from logging. I could be wrong but I think the travel bloggers did a great contribution in spreading out awareness about elephant tourism. Now people are more aware that this should be discouraged and that elephants should be protected. This is the first time I’ve heard of such effort in Cambodia and I applaud it. I completely agree, and I think this goes for all types of animals. Let’s hope people keep spreading the word on both the projects to avoid and those that are ethical! Yes you’re right the food was really good too. Plenty of it and pretty healthy! Great experience. What a rewarding and interesting experience it is. I loved going through your post and the story of elephants are really interesting too. I had never thought about volunteering for any such project but after reading your post i felt it is a cool idea and wil love to do it in future. I hope you get to do it one day! Definitely worth it! I like this idea of volunteering – it definitely helps you give back something while you enjoy the fantastic beasts. The duo sounds like fun – with their baths and mischief. And spending time in the forests with the sights and sounds like the butterflies, sure would make my day! Hope you get to visit here or somewhere similar ? This looks like a great place to see Elephants getting to enjoy their habitat again. I love the look of the night in the forest – although I’ve had encounters with bugs in Cambodia to last me a lifetime haha. It was great…we really enjoyed being out in the forest. Would have loved to stay longer. Nice to read an article from someone being thoughtful about their impact in Cambodia! Loved the description and I cannot wait to spend a half day there (tight buddget, I wish I could spend more time!). A couple things I noticed, if they are run by an NGO, why do they need to donate proceeds to charity? Instead, couldn’t they use that money to employ more locals to work in the nursery, say, so that they don’t give that low level work to foreign voluntourists? Just some questions, I realize you probably don’t have the answers. Anyway thanks for the great write up! Thanks Ali, the half day is great too, as you’ll get to spend it all observing the elephants. I’m afraid I don’t know the answer to your question but I’m sure EVP will be able to answer when you visit or if you email them. I hope you enjooy your visit when you go! Sounds like you had a good time! I’ve really only read about these kinds of places in Thailand, so it’s nice to see they exist in Cambodia too. I find it a little strange that one of the workers was sitting on the elephant in the one photo, since what I’ve always read about ethical treatment of elephants is that you should never ever ride them. But it sounds like this place is at least taking steps in the right direction. The man sitting on the male bull elephant is its mahout. He is a Bunong man from the family where the elephant came from and has worked with him all his life. Unfortunately because these elephants have been in captivity all their lives the only bull elephant in the sanctuary needs to have their manhout still otherwise when in ‘Musth’ he would run rampant and could be dangerous to anyone in his path. The mahout only sits on the elephants neck which is the only part of an elephant which can safely (without hurting the elephant), hold a mans weight. The mahout is the only person that would ever ride this elephant. All he does is guide the elephant and ensure he doesn’t put himself or others in danger. He would never harm the elephant! I’m pleased that you found an elephant volunteering project in Cambodia that seemed ethical. It must have been wonderful following the elephants acting naturally. I’d love to do this! 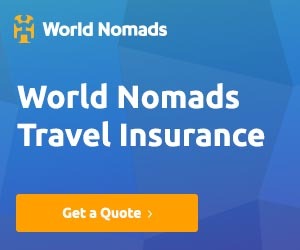 Would you recommend booking it directly through the organisation? Hi, Yes it really was great. I’d recommend booking it directly via their website! Yes definitely and it’s so hard to know with places like these if they really are ethical until you get there. If you ever get the chance to go there I highly recommend it! I’m so happy to read this kind of post. It is something that people around the world can learn from, especially those that have wild animals and need to be protected. This is truly a great example for responsible and sustainable development. I like how they came up with this Idea. Thank you so much for sharing this with us. Thankyou, I’m glad you enjoyed the post! Nice story but you should not believe everything you are told. Yes EVP has done a good job rescuing elephants but they are not really an ngo. Did you see their accounts? No. In Cambodia you pay to become and NGO and then no one checks where the money goes. EVP is a business owned by Englishman Jack Highwood. Their claims that 50% of their profits go to charity is a lie. Jack Highwood has spent most of EVP profits starting his own private elephant sanctuary in Thailand. EVP is diverting money away from Cambodian ecotourism to Thailand. Thanks for reading and your comments, it’s always good to hear others viewpoints. I’m far from naive and don’t believe everything I’m told but you’re correct of course we didn’t see the accounts! I’d be most interested in understanding more about this whilst I’m in Cambodia! It’s fascinating to read this post when sustainable and inclusive development is one of the most talked about points. Through this post, I remember the India launch a Project Elephant in 1992 to save the beautiful creature of God! Now, there are about 28 elephant corridors in India. Hi, I’m glad you found it fascinating, I just hope that more places as ethical as these are opened across Asia.